What is the minimum age eligibility for half marathon? The registration fee paid is exclusively for your race category participation in the Airtel Delhi Half Marathon 2018. The registration fee is not, in part or full, payable for any offers / promotions / discounts / goodies / Race Day T-shirt, etc. that are offered, directly or indirectly, by the Promoter / Event Sponsor / Partner. Will I get a Race Day T-shirt?? Race Day T-shirt is offered only to confirmed participants of Half Marathon category. While the Airtel Delhi Half Marathon and Puma will make best efforts to get you the mentioned T-shirt size, the promoter or sponsor will not be held responsible in case of shortage of any T-shirt size / colour. The colour and sizes of Race Day T-shirt are ordered well in advance. In case of any shortfall, the next available size will be offered. An online applicant can pay ONLY via credit card, net banking, debit card or buy using scratch card. I have recently started running. Can I participate in the Half Marathon without a timing certificate? Registration for half marathon (21.097 km) is open only for timed runners, applying with valid timing certificate as explained in “Timing Certificate”. This rule is not applicable for limited running spots that are reserved for “Women’s Criteria” & “Charity running places”. What will happen once I submit my Half Marathon application under confirmation preference criteria? 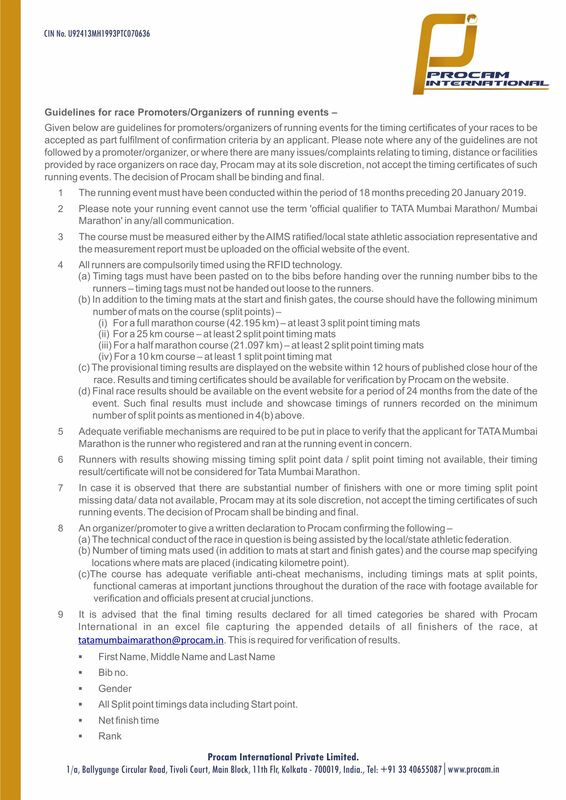 What will happen to my application if I am not able to apply under the criteria ‘Timing Certificate Criteria’/ ‘Women’s Criteria’, in Half Marathon race category? In this case, your application will be rejected. Registration for half marathon (21.097 km) is open only for timed runners, applying with valid timing certificate as explained in “Timing Certificate Criteria”. This rule is not applicable for limited running spots that are reserved for “Women’s Criteria” & “Charity running places”. What are the advantages of me submitting a timing certificate that I have acquired in the last 24 Months ? Applications received with a timing certificate attached (having finish times of relevant cut-off timings), have a higher chance of being confirmed in their respective race categories. Once confirmed, the advantage will be visible on race day (Sunday, 21st October 2018). Confirmed applicants of half marathon category will be eligible for priority line-up on race day in their respective timing sections. This will be based on the finish time given in the submitted timing certificate. *Half marathon line-up sections given above are indicative and may undergo a change which will be communicated on the event website, post close of all registrations. Can I and my group of friends/colleagues submit our applications together as a group?Can I and my group of friends/colleagues submit our applications together as a group? No group applications will be accepted for the Half Marathon race category. Also, please do not club Half Marathon applications with group applications of Great Delhi Run, Senior Citizens’ Run and Champions with Disability – such applications will be disqualified. Yes,however, a representative can submit individual applications for not more than 5 applicants. Yes, it has to be provided with each application form at the time of submission of application. Online applicants need to attach clear copy of their Govt. issued photo ID proof whilst submitting application; the photograph size should not exceed 2 MB in .jpeg, .gif and .png format. Govt. issued photo ID proof will include documents like Passport, PAN Card and Aadhaar Card. While applying online, I am not receiving the email to reset my password. What should I do? Unregistered applicants can approach Event’s official Philanthropy Partner, India Cares Foundation, for charity running places. Such charity running places will be available at premium and the proceeds of the same, minus the applicable entry fees, will go to the NGO chosen by the respective runner. It is important that the NGO must be listed as participating NGO with India Cares Foundation. For more details, you may visit http://icfn.in/adhm/. Participation in the event is subject to entry confirmation. Where your entry is not confirmed for any reason, the entry fees paid by you will be refunded on or before 19th November 2018. An amount of Rs. 150 will be deducted as processing charges. You will be required to provide your bank details on a link provided by the Event’s Registration team. Any refund discrepancies must be brought to the attention of the Event’s Registration Team immediately. Refund queries will not be entertained post 29 th November 2018. Confirmed participants of half marathon who are unable to participate on race day due to unavoidable circumstances like injury or illness, will now be able to surrender their bibs to Procam International. The application fees paid will be refunded post education of Rs. 150 as processing charges. Confirmed participant can only surrender his/her bib with effect from 14th September 2018 to 21st September 2018 by filling the bib surrender request form Online. Requests for cancellation/bib surrender and thereby, refund will not be entertained post 21 st September 2018. Further, application fees shall not be refunded by virtue of non participation, including failure by a confirmed participant to collect his/her bib from the Expo.